Custom Mirrors at La Linea Bella ! Mirrors are a designer favorite at LLB. They are a fantastic way to break up a wall, add some light, or open up a space. And, of course, they are useful in bathrooms and hallways. They can also feature your favorite frame as a dramatic design element. They can be leaned, they can be hung, you can pop a small or large mirror anywhere you would like to add some interest! Indulge your wall in a little beauty treatment, and pop a mirror into a fabulously stacked frame to add some pizzazz and sparkle to your room. La Linea Bella ! 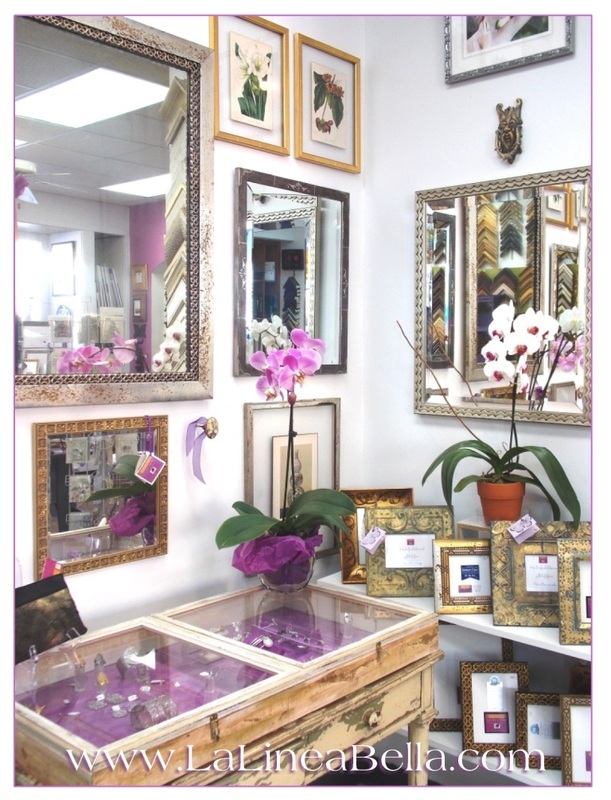 frames mirrors, and we do it well, to your taste and to your budget. And with our great selection of mouldings, you're bound to fall in love with the perfect choice! For more visual inspiration, CLICK HERE. For inspiration from our friends at The Scout Guide: click here. - The conventional wisdom has long been that mirrors are an easy way to bring light into a space and make rooms appear larger. That's definitely true, but it also sells mirrors short. The best ones can function as works of art and have the same outsize effect in a room as a dynamic painting—at a fraction of the cost. As designer Nick Olsen points out, "They provide so much. A large, bold mirror, like a powerful artwork, provides scale. It creates a textural contrast with the surrounding wall. And if it has an ornate frame, it provides an architectural quality as well." Sara Gilbane agrees and says she uses mirrors in virtually every project. "There's just something very appealing about a mirror," she says. "They are a way to create the effect of a window in a window-less wall. They provide a grace note, whether in a room that's supermodern or traditional. Decorating with a mirror is the oldest trick in the book, but it's still around for a reason." Copyright 2014 La Linea Bella ! Fantastic Framing & Art. All rights reserved.